Shows county boundaries, township sections, railway routes, shipping routes to Key West and Havana. 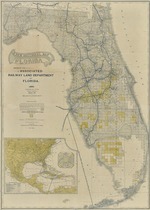 Sections owned by Associated Railway Land Department of Florida are colored in yellow. Inset: The Plant system of railways and steamship lines. issued by the Associated Railway Land Department of Florida ; George Fox, chief clerk.